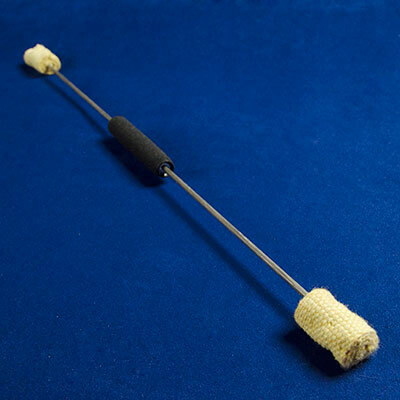 The important factors to consider when selecting an eating and fleshing torch are wick stitching and size, grip comfort, and performance possibilities. These eating and fleshing torches have hand-sewn 1.5” wicks. To ensure that they absorb as much fuel as possible, they are intentionally sewn to be spongy. A tightly-wound wick will not absorb as much fuel, making it harder to do fuel transfers and vapor tricks. We also sew in a way that hides the Kevlar thread, ensuring that it doesn’t burn out or become otherwise damaged, which would make your wicks fall apart prematurely. These torches have a foam rubber grip that ensures control and fits comfortably in the palm and between the fingers, allowing for a wide range of movements. The two wicks on this torch allow for a wide range of one-handed flame transfers. In addition, the length and weight of this torch allow for baton movements, increasing its performance possibilities.